The ousted government in the metro will be filing their legal papers to reinstall Trollip as the mayor on Friday. UPDATE: The original version of this article said that the DA had already filed papers on Friday and that it was a formal statement. The article was in fact based on a draft statement and the party only planned to file its papers later on Friday. The former ruling coalition in Nelson Mandela Bay is planning to file legal papers on Friday in the Port Elizabeth High Court against the new metro government led by the United Democratic Movement’s (UDM’s) Mongameli Bobani. In a draft statement The Citizen has seen, it is clear they believe ousted executive mayor Athol Trollip was illegally removed from his position during an “unlawfully convened continuation” of the council meeting that took place on Monday. The DA, African Christian Democratic Party (ACDP), Congress of the People (Cope) and Patriotic Alliance (PA) are confident they will succeed in their application. “It remains our steadfast position that the convened continuation of the council meeting was procedurally invalid and lacked legitimate authority to legally elect a new speaker, and then subsequently pass the motion of no confidence in the executive mayor (in absentia),” the draft statement says. The party will be relying on Section 36(3) of the Municipal Structures Act that states the municipal manager should preside over the election of a new speaker – a representative from cooperative governance and traditional affairs could only have taken over if he was unavailable. “It is an undisputed truth that the city manager, Johann Mettler, was in fact at all times available and remained so for the full duration of this unlawfully convened continuation of said council meeting,” say the parties. They have maintained that Mettler was correct to declare a councillor vacancy in the DA after the axing of their turncoat councillor Victor Manyathi, and that there could not have been a quorum, at that point, to allow for the continuation. The new coalition government, however, has countered that Mettler adjourned the council meeting prematurely and unlawfully simply to save Trollip from inevitable removal. 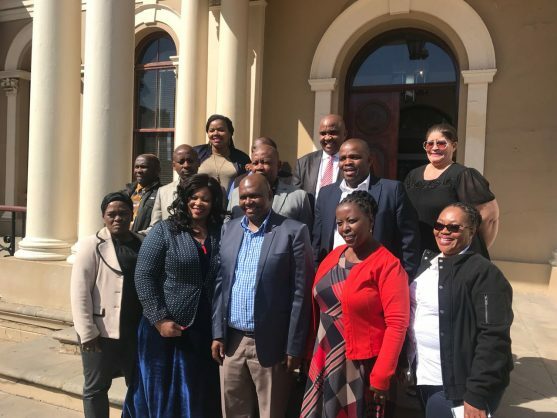 They have said that only the Independent Electoral Commission of SA could have declared the councillor vacancy, which did not happen, while the quorum was accepted at the start of the meeting. It should therefore not have had to be re-examined mid-meeting. The new government also believes that, since Mettler adjourned the meeting despite protests, he in effect made himself unavailable to continue with the election of a new speaker – and therefore the MEC for cooperative governance and traditional affairs, Fikile Xasa, was justified to invoke Section 36(3) and send a designated individual to preside. The DA, however, will counter on Friday: “Despite the fact that the city manager was both present and not incapacitated to preside over the sitting, he was denied his role by MEC Xasa and the person designated by him. This is in contravention of the clear requirements of the Municipal Structures Act and therefore renders the election of Buyelwa Mafaya as speaker, the subsequent motion of no confidence in Athol Trollip and the election of Mongameli Bobani as executive mayor invalid in law. “The EFF, UDM and sole other opposition parties have actively attempted to hand Nelson Mandela Bay back to the very thieves and crooks who had previously brought the metro to its knees.